Nexus is a Location in Mass Effect Andromeda. Inspired by the Milky Way's Citadel, it is the home base for the citizens who have made the journey to the new galaxy. 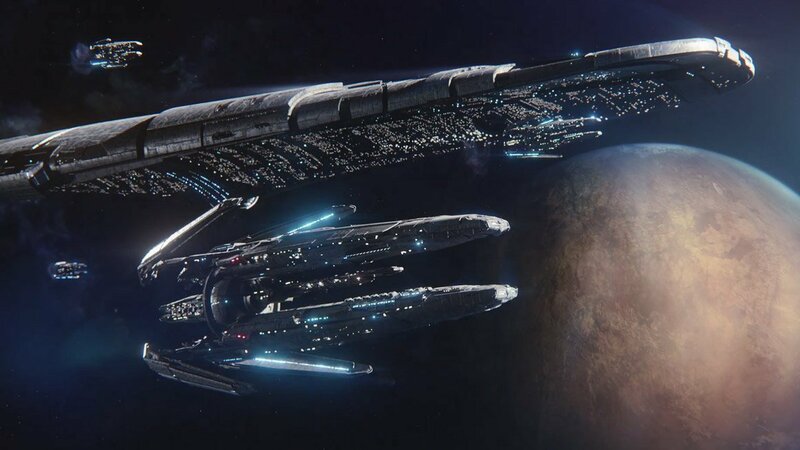 Headquarters of the Andromeda Initiative, the Nexus is a massive space station designed to anchor the returning arks, process resources, and support colonists before their departure to new worlds. All new arrivals must pass quarantine. The Nexus itself requires resources to be gathered from worlds which can be used to complete upgrades to it and awaken more colonists to help with the mission. Succeeding in various tasks on a planet improves its viability to set up an outpost which lets you make upgrades to the Nexus home base. Science Pods: Selected for their years of experience and ingenuity under pressure, these scientists' expertise can quickly improve the Iniative's research and resource gathering capabilities. Military Pods: Military veterans from across the Milky Way have brought their expertise to Andromeda including advanced combat training and wilderness survival skills. Commerce Pods: Trade is the lifeblood of civilization. These talented merchants and entrepreneurs can use their connections to acquire rare items, grow financial investements, or improve inventory management. The Tech Lab is where you perform Research and Development. Research is where you unlock new Blueprints for Weapons and Armor and Augmentations using the Research Data (RD) you've acquired. Development is where you craft new Items and Upgrades. Operations is where you will find the leaders of the Initiative. Docking Bay with the Vortex bar and a bartender you can obtain Missions from.